Teaching Teachers With Theater! 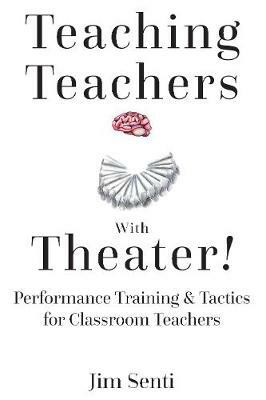 : Performance Training & Tactics for Classroom Teachers explores day-to-day classroom performance challenges K–12 teachers face and how the practice of certain theater techniques used to train actors can improve a teacher’s student engagement and connection. Jim Senti’s work exposes K–12 classroom teachers to the activities and training that will help them become a more comfortable, connective, exciting, and engaging teacher in the classroom. Teaching Teachers With Theater! defines typical challenges teachers face in the classroom. The activities in each chapter vary from how the reader can improve their body language, voice, and physicality to illustrating how developing acute observation can help train a teacher’s empathy and compassion. This book also explains how improvisation games help train a teacher’s ability to deal with surprises in the classroom and even offers some tips on how to tell a great story. Teaching Teachers With Theater! translates the vocabulary used in theater to a vocabulary a teacher often uses and gives teachers simple step-by-step activities, which could be extremely useful in faculty development. In the end, these practices will help teachers become stronger communicators by learning to be far more comfortable with performing in order to genuinely connect with their students. If a teacher is comfortable in their ability to communicate, they will have a stronger connection with their students. They will without question become far more entertaining to their students. This engagement will solve the majority of classroom management issues.